The Turnip is a hardy plant that has been cultivated for over 4,000 years and is believed to have originated somewhere in central Asia. Turnips are widely cultivated for human food and livestock feed, but they have often been considered as only fit food for the poor an starving. 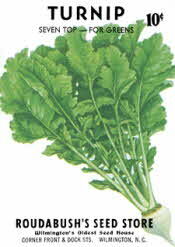 Turnips were cultivated in Virginia as early as 1609. Turnips grow best in cool climates. Spring varieties do not keep, but winter varieties will keep for up to 2 months in a cool place. Their excellent keeping properties made them a wintertime staple. They are low in calories and a good source of vitamins A and C, potassium and calcium.